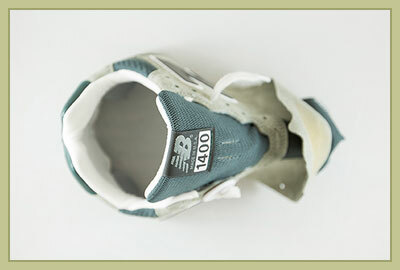 U.S. service members could soon wear New Balance sneakers. Here’s how Maine workers make them. The Berry Amendment has been on the lips of Maine politicians for most of this decade. The World War II-era policy, which requires the Department of Defense to outfit its soldiers in American-made clothing, has been skewed, according to Maine's congressional delegation. Military personnel should be clothed head-to-toe in U.S.-made garb, they say, but, because of a loophole, many are only equipped head-to-ankle. New recruits receive vouchers to buy their own athletic footwear, which means many soldiers purchase sneakers made in Asia. 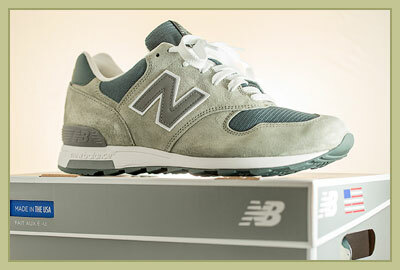 Maine's delegation would like to see those men and women buying sneakers made in Maine, where New Balance operates three factories. It appears that could soon happen. On Capitol Hill, two versions of the National Defense Authorization Act are making their way through Congress, and both would close the loophole if passed as written. 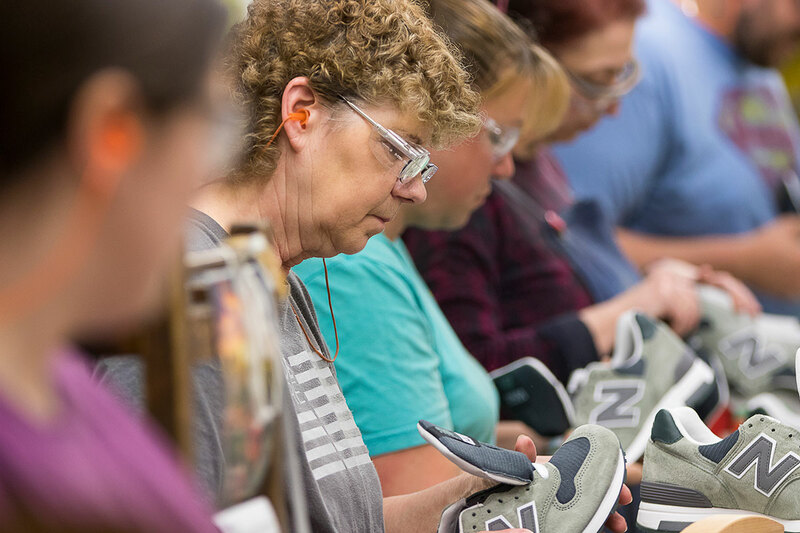 In the meantime, work continues at New Balance in Maine, where nearly 900 workers build sneakers in Norridgewock, Norway and Skowhegan. 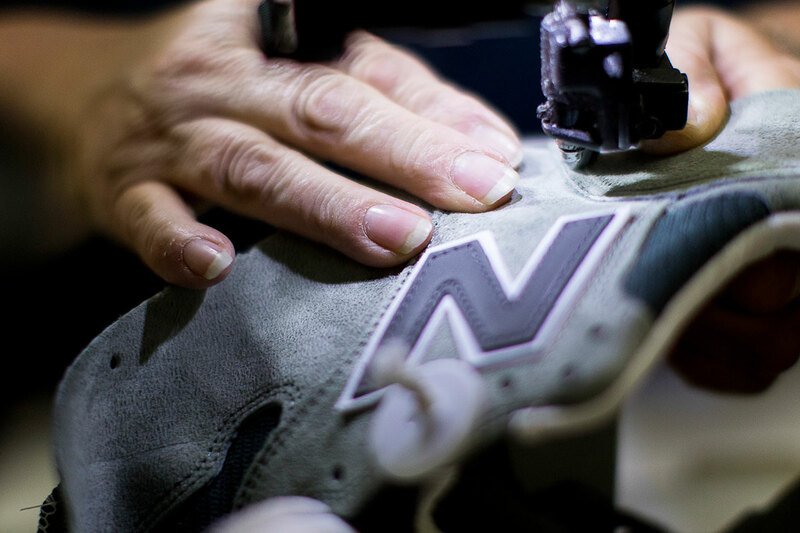 At the Skowhegan factory, about 45 workers make the New Balance 1400 – a higher-end sneaker with suede accents and a retro design. This is their story in pictures. You've got this nice, big factory right here in Skowhegan, Maine, that dosn't have a whole lot of other jobs around. It's a good job with a good schedule, good benefits, vacation time, health insurance. I mean, it's a real good thing, you know? There's not a lot like it around here." 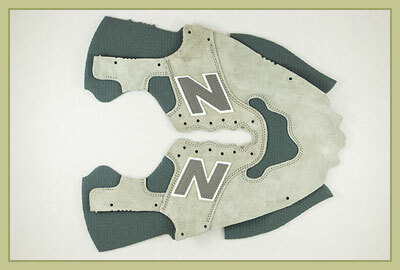 New Balance workers cut suede into patterns. 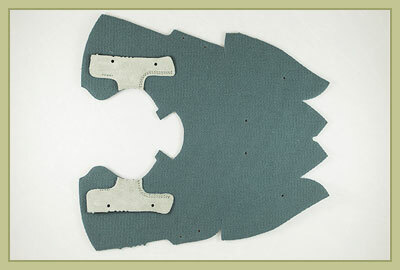 Michelle Bishop, a seven-year employee from Skowhegan, cuts patterns in synthetic fabric for the shoes' uppers. 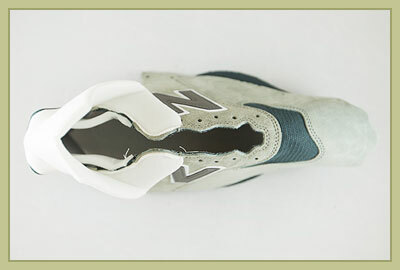 It takes less than three hours for a single New Balance 1400 sneaker to wend its way through the assembly line – from the leather cutters, through myriad sewing machines, to the person who ultimately wraps it in tissue paper and tucks it into a box. It used to take much longer – up to nine hours – but the system was streamlined in 2004, according to Plant Manager Raye Wentworth. 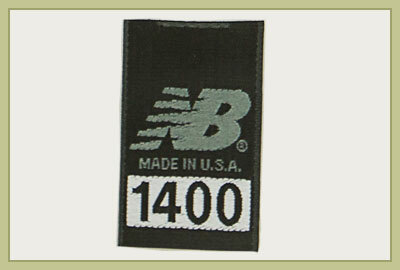 The entire upper of the New Balance 1400 comes from U.S.-made suede and textiles, which are cut and assembled in Skowhegan. 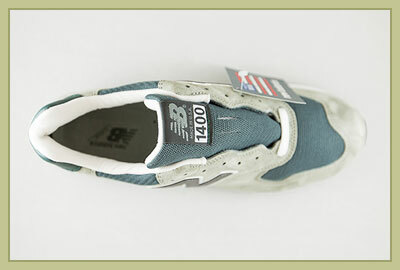 The rubbery soles for the 1400 are imported, but Wentworth wouldn't specify where they come from. 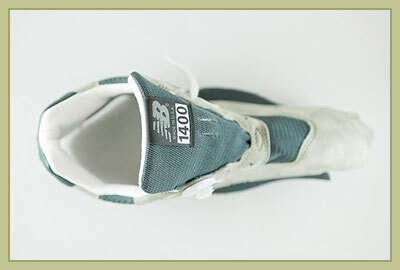 If the defense act passes with the changes in New Balance's favor, the uppers would be built in Skowhegan, then shipped to Boston – where the company manufactures domestic soles – for completion, Wentworth said. It's too soon to say whether any defense contracts would lead to job creation or expansions in Maine, Wentworth said. 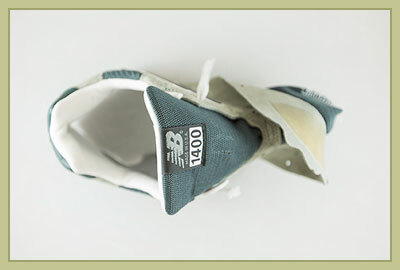 Obviously, if the (military's) clothes are American-made, the shoes should be the same way. They should be made in the United States." 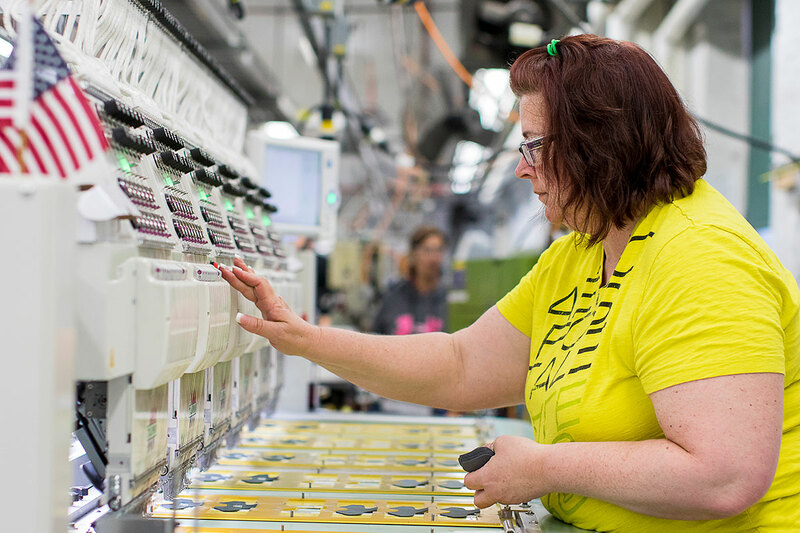 Shauna Fitch, a four-year employee from Fairfield, operates the embroidery machine. 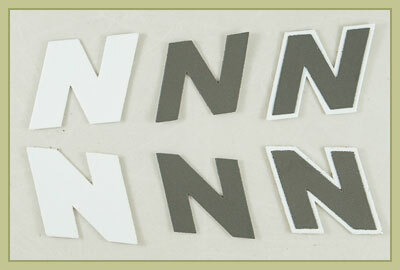 Holly Weaver, a one-year employee from Solon, stitches labels to shoe tongues. 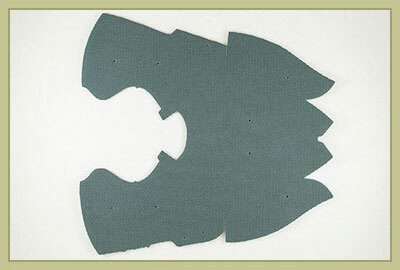 Sheila Horton, a machine operator from Skowhegan, adheres cloth Ns to a rigid backing. Horton is a four-year employee. New Balance was founded in 1906, but entered its modern era in 1972, when Jim Davis, a marketer from Massachusetts, bought the company. 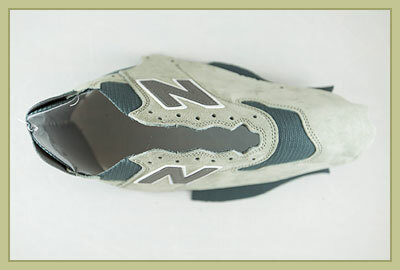 At the time, New Balance employed six people in Brighton, Massachusetts. 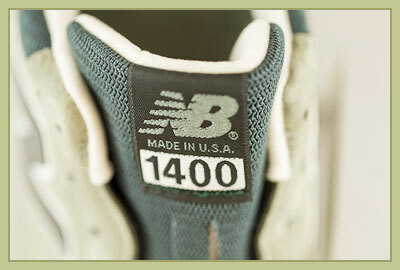 Today, New Balance has grown to 5,227 employees, 3,668 of whom are based in the United States. 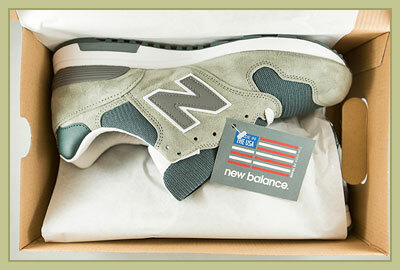 In Maine, New Balance employs 888 factory workers: 396 in Norridgewock, 338 in Skowhegan and 154 in Norway. 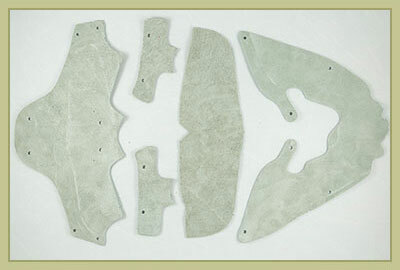 The Skowhegan factory continuously manufactures seven product lines. 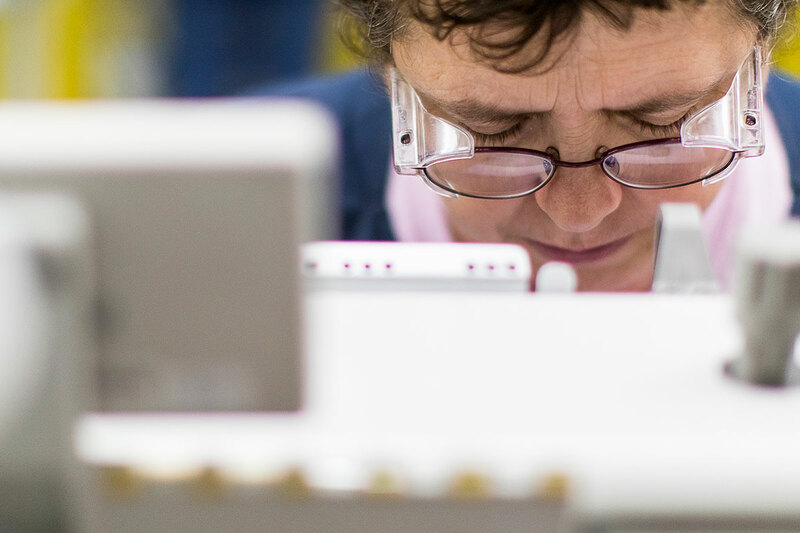 Between 38 and 45 employees work on each product line. 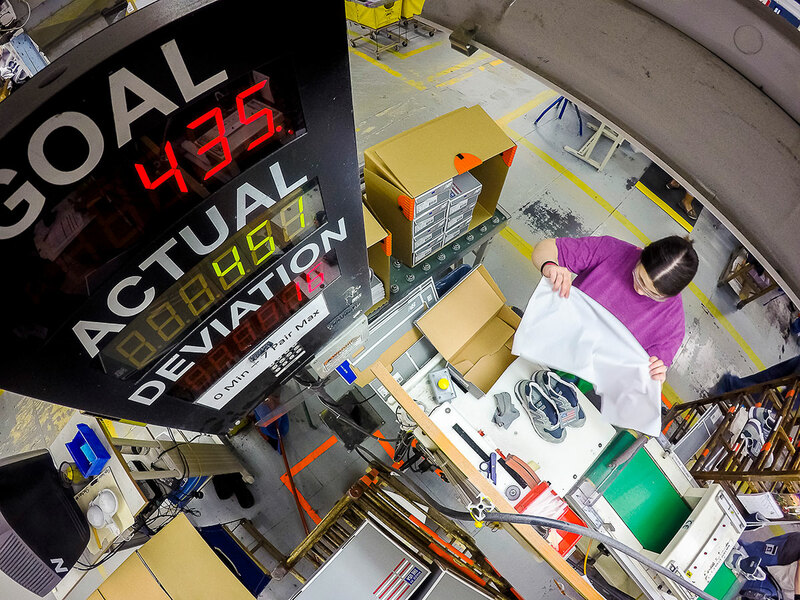 Wentworth wouldn't say how many shoes are produced on a daily basis in Maine, but on May 5 – the day these photos were taken – the factory produced more than 450 pairs of the 1400, according to a digital "scoreboard" that kept track of production. I could be a grandmother to some of these people in here. I look at some of them and think, 'Jeez, you're not old enough to be employed.' But we all have a common goal to make good shoes. We have a lot of pride in what we're doing." 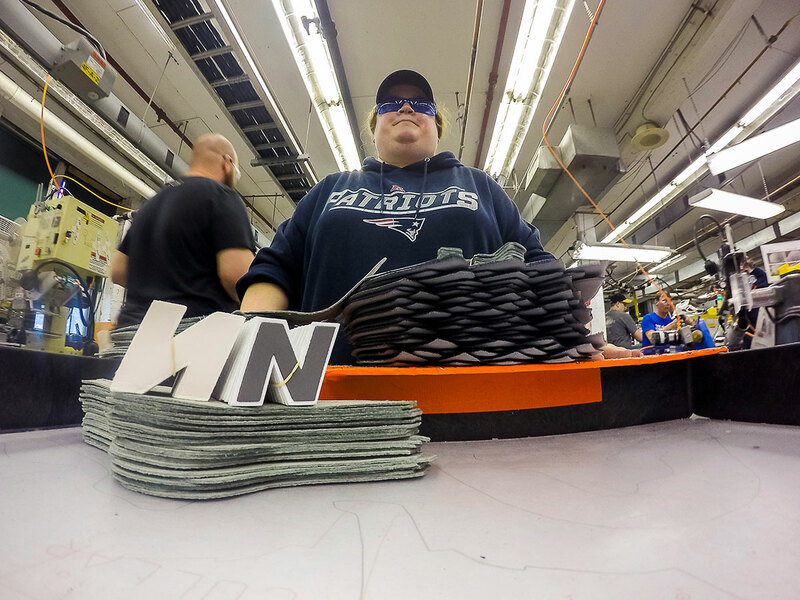 Shawna Towle, an eight-year employee from Skowhegan, delivers shoe parts throughout the manufacturing line as they're needed. 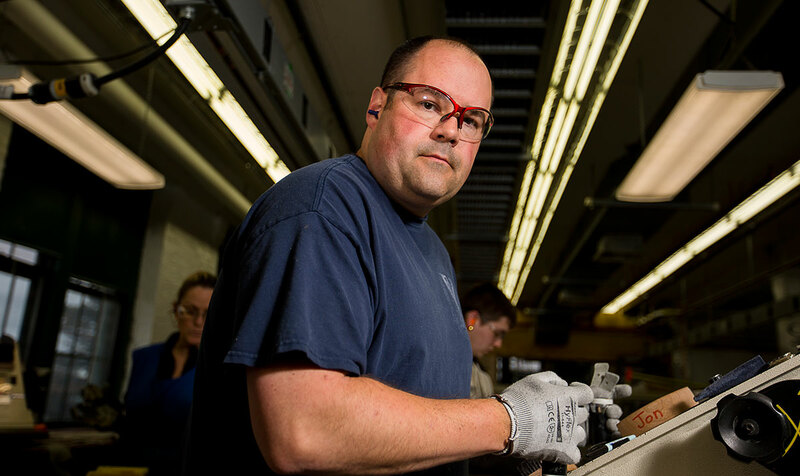 Nathan Gourley, a one-year employee from Skowhegan, assembles New Balance 1400 uppers. 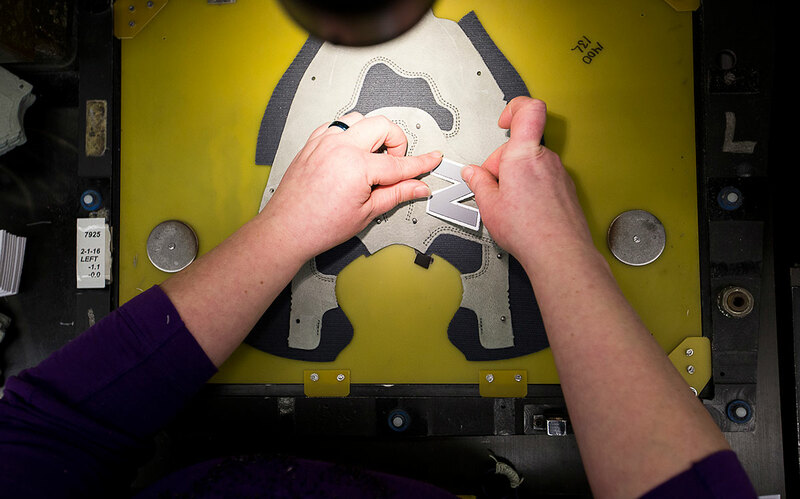 An assembler applies an N to a sneaker-in-progress. 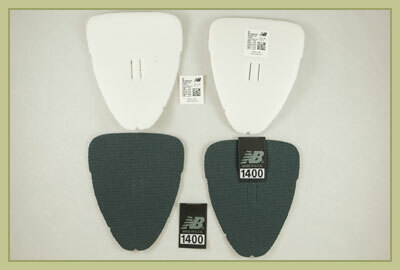 Deborah Dore, a 22-year employee, prepares to stitch backtabs to the upper of a New Balance 1400. 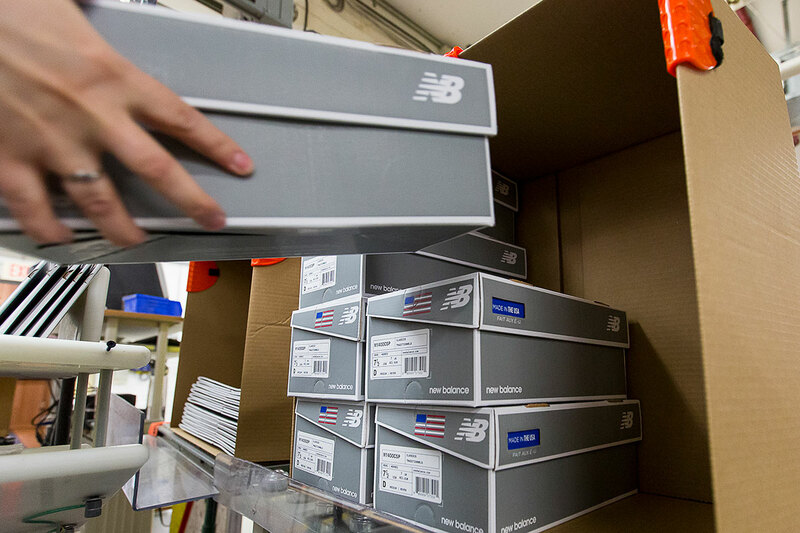 Maine's congressional delegation has been making political hay over the Berry Amendment since at least August 2011, when then-U.S. Sen. Olympia Snowe, R-Maine, toured New Balance's Norridgewock factory. Since then, the factories have been a regular campaign stop for many politicians. In 2012, then-U.S. Rep. Mike Michaud, D-2nd District, kicked off his congressional campaign against Kevin Raye with a tour of New Balance with U.S. Trade Representative Ron Kirk. A year later, Michaud announced his ultimately unsuccessful campaign for governor by holding up a custom pair of New Balance 574 sneakers with "Michaud 2014" emblazoned on the heels. As recently as April, Michaud's congressional successor, U.S. Rep. Bruce Poliquin, R-2nd District, held a New Balance sneaker during a fiery speech at the state Republican convention in Bangor. Beyond stump speeches, Maine's delegation has been hammering away at the issue in Washington in recent weeks. In late May, the U.S. Senate began considering the 2017 National Defense Authorization Act, which includes a provision by U.S. Sens. Susan Collins, R-Maine, and Angus King, I-Maine, that would require the Defense Department to provide new recruits with U.S.-made sneakers upon arrival at basic training. Earlier, the House had passed a similar version of the defense act, with similar language from Poliquin. If the Senate passes its version, a House committee will be tasked to work out the differences between the two and send a revised version through the system for approval by the House, the Senate and, ultimately, the president. According to the delegation, the issue is a no-brainer. "When the men and women of New Balance give so much to their work and do it so well, don't they deserve to know that their government's got their back? That their government will do all it can to support them? I think so – but, sadly, that's just not where we're at today," King said in a recent written statement to the Press Herald. "Instead, we find ourselves having to fight the Defense Department just to get them to issue American-made athletic footwear to new recruits like the Berry Amendment intended. But it's a fight that needs to be had because investing in American jobs and in American manufacturers like New Balance is what this country should be doing. We should reward companies for creating jobs in the United States. We should have their backs." 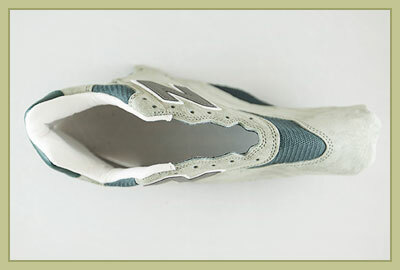 It would be amazing (if the military were required to purchase U.S.-made athletic shoes). And I think that's the way it should be. It should be us making their shoes, you know? The military is the U.S.A. We should be making their stuff. The government should be on our side. Period." 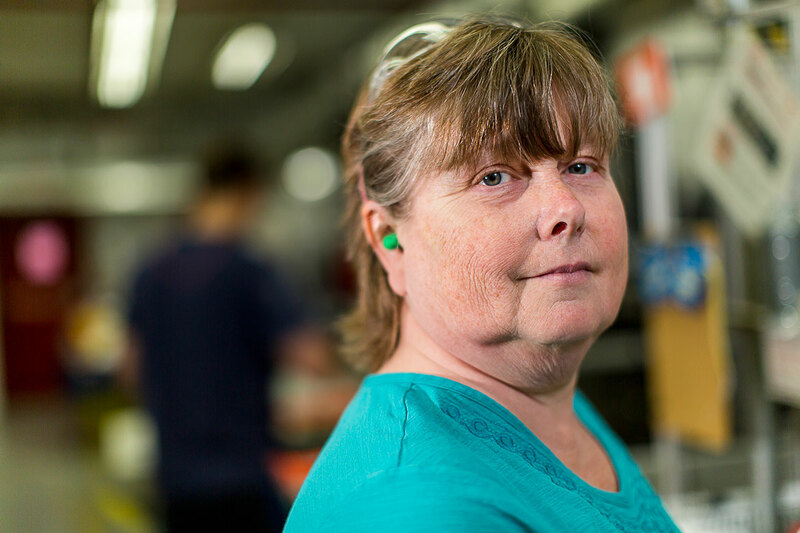 Brenda Barney of Skowhegan is a 22-year employee. 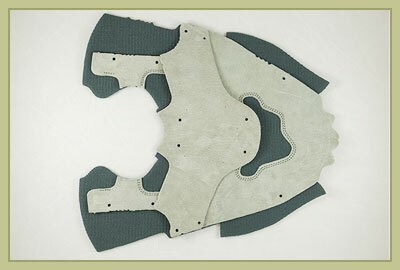 Brenda Barney stitches the shoe's foxing - the joint where the upper and sole meet. 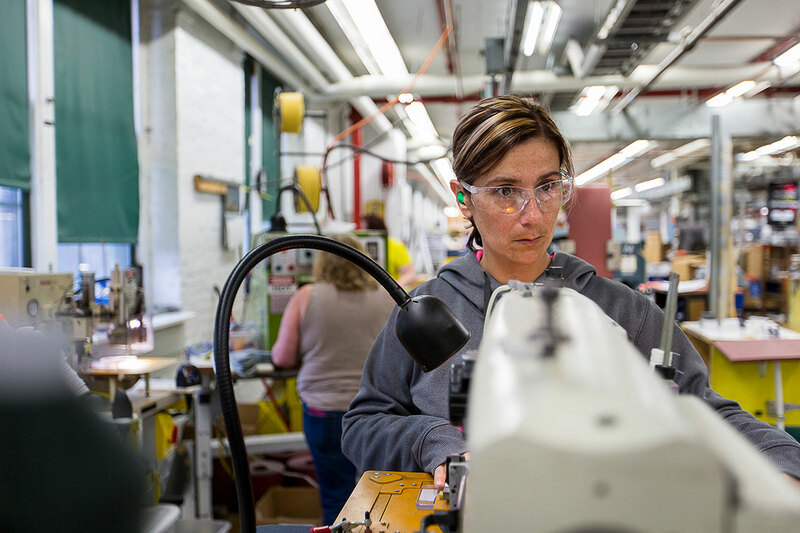 Manufacturing accounts for 8.2 percent of Maine's workforce and more than 10 percent of the state's economic output, according to a recent report by the National Association of Manufacturers. Manufacturing output in Maine exceeded $5.5 billion in 2014, and the average yearly pay for manufacturing workers was $61,000, compared with a yearly average of $40,000 for workers in nonfarm businesses, according to the same report. 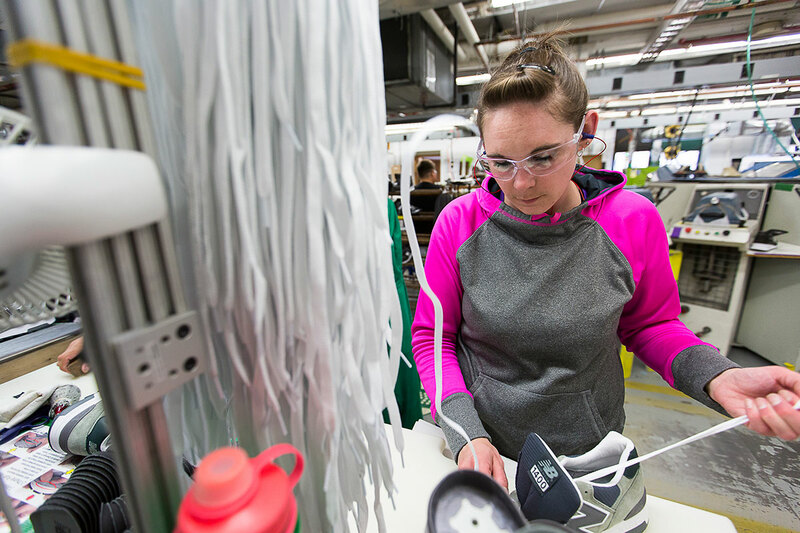 "Apparel and leather and allied products" is the 10th-highest manufacturing sector in Maine, accounting for $138 million in output, according to 2013 data. 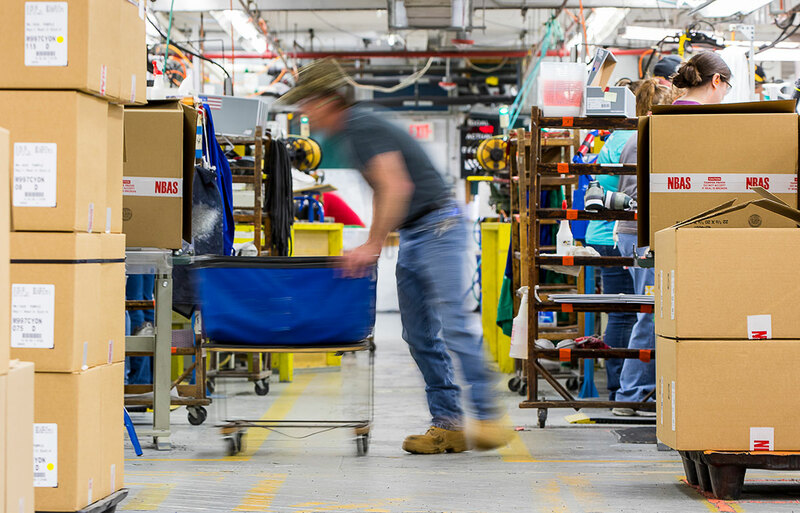 In Somerset County, the home of New Balance's three Maine factories, the average weekly wage for manufacturing employees is $983, according to data from the U.S. Census Bureau. I love working here. I love working with my hands. I'm very much a hands-on kind of guy, so it's nice to have a job like this. It's always fun." Joseph Quirion, left, and Steve Graham add lasts to the shoes before the soles are added farther down the line. 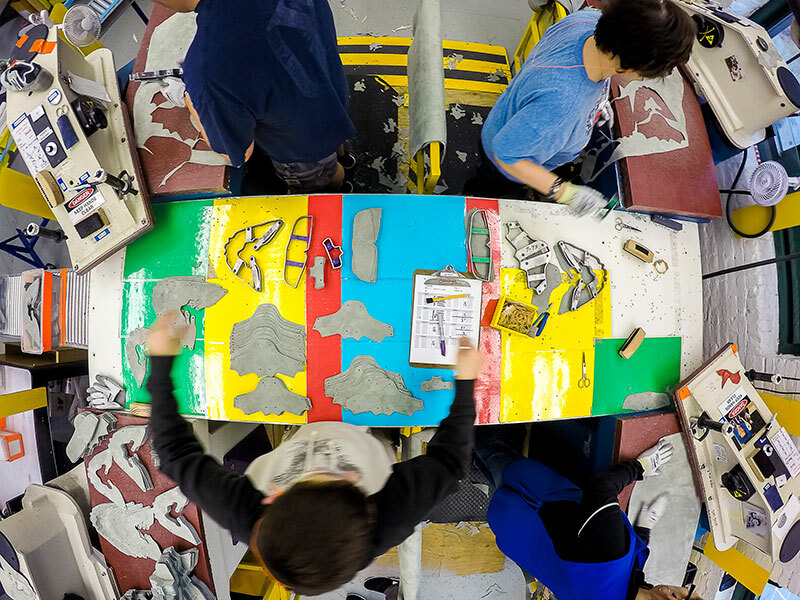 Richard Park, a three-year employee from Skowhegan, spreads rubber cement on a shoe before the sole is added. 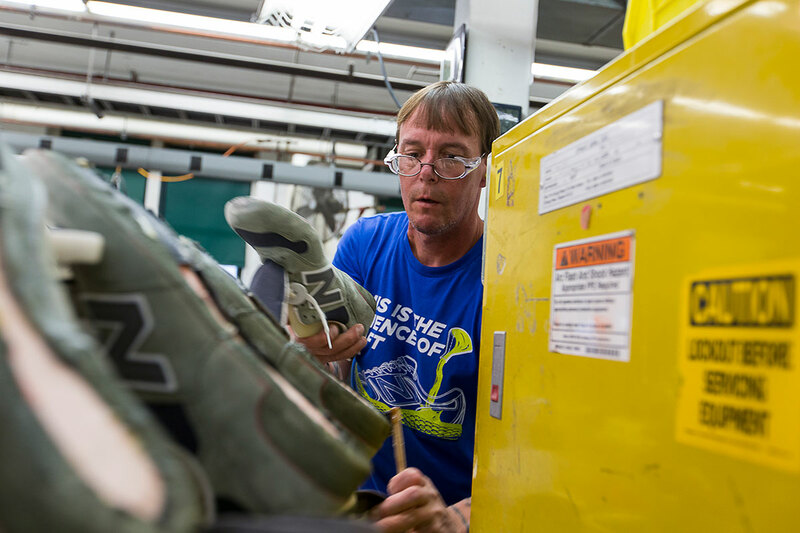 Eric Boynton, a two-year employee from Skowhegan, primes the shoes before the soles are added. 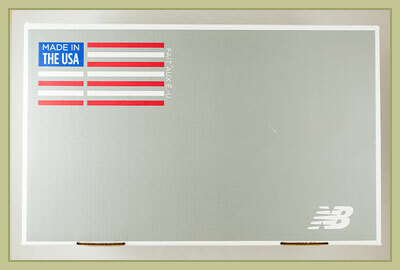 On the whole, output from U.S. manufacturers is similar to Maine's. Manufacturing accounts for 12 percent of the nation's output, compared with 10 percent in Maine. 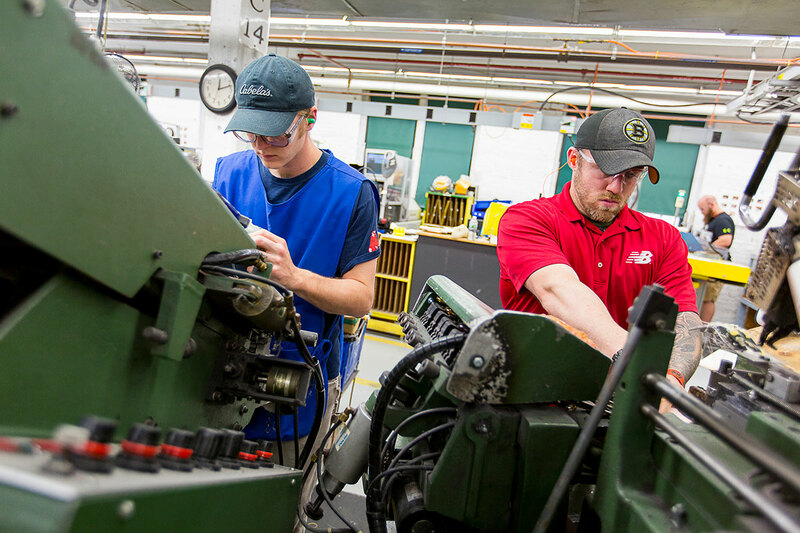 The total U.S. manufacturing workforce is 8.7 percent, just slightly higher than Maine's 8.2 percent, according to a recent report by the National Association of Manufacturers. 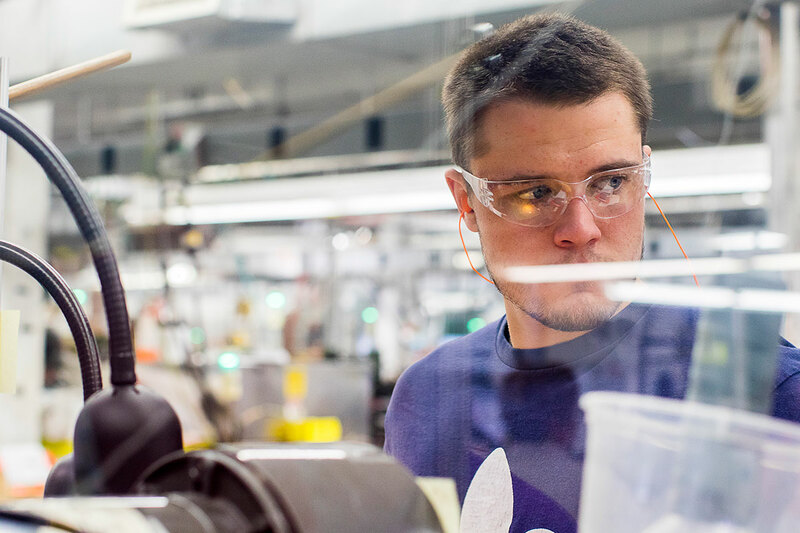 Average U.S. manufacturing wages are significantly higher than those of Mainers who hold such jobs, however, at nearly $80,000 per year compared with $61,000. You put everything you have into this, knowing that your product is going to be shipped everywhere." 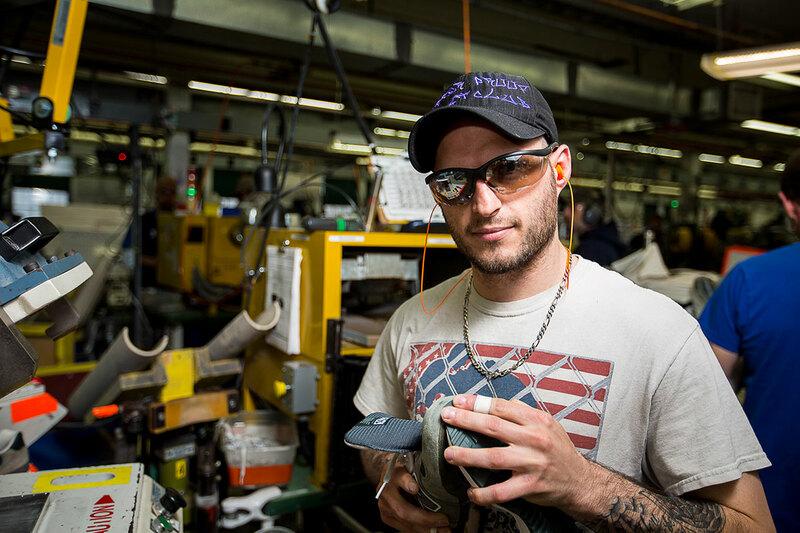 Ashley Cole, a one-year employee from Palmyra, threads a shoelace into a nearly finished shoe. Deborah Brown, a 14-year employee from Cornville, inspects a completed shoe before it is boxed up for shipping. 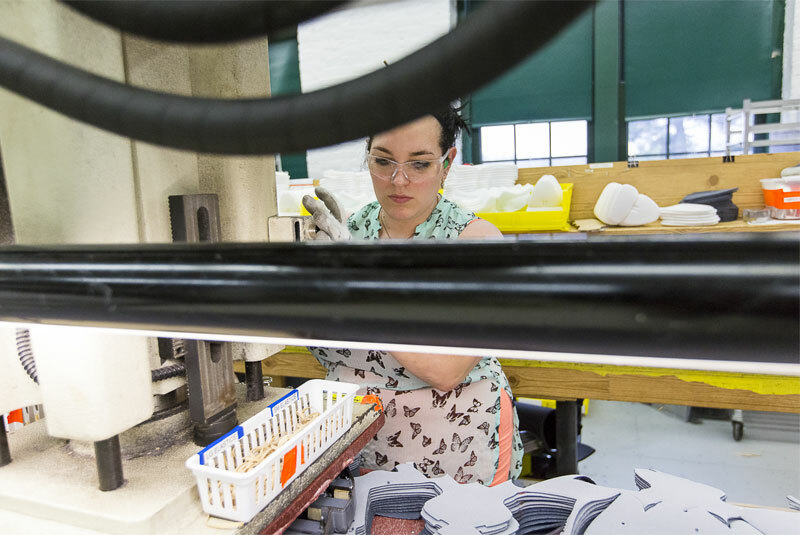 Alison Davis, a 10-year employee from Cornville, prepares a sheet of tissue paper to box a completed pair of shoes. Alison Davis shelves another completed pair of shoes for shipping. 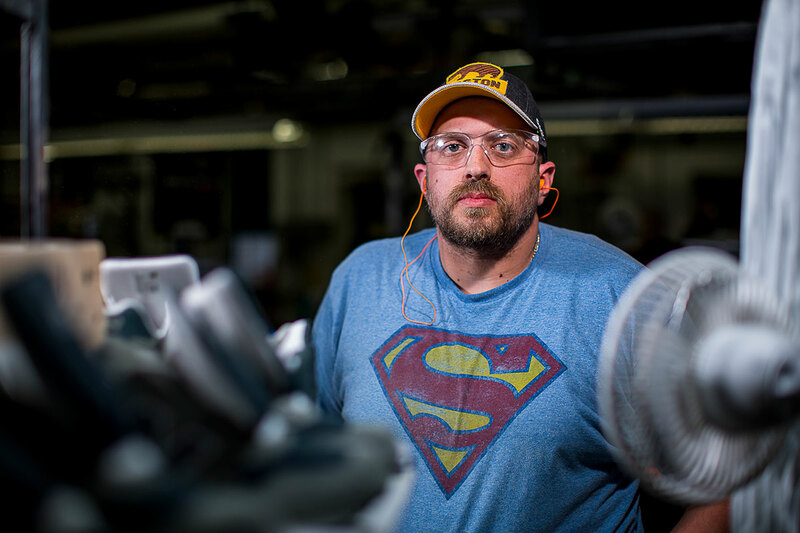 Ricky Libby, an eight-year employee from Madison, delivers materials to the factory line.